Hi, being a quite active Stackoverflow sites galaxy users, I become to be quite tired of always switching from one site to another. Wouldn't it be cool to have a website that gives me an aggregated view of all my activity on the StackExchange network ? 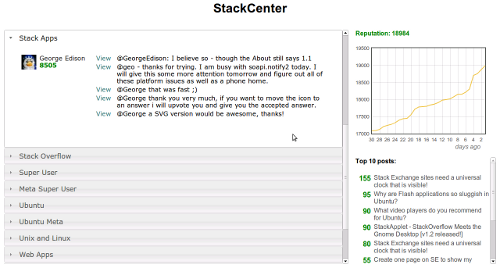 Giving me comments/replies for my questions on all sites where I'm a registered user, even for the area51 created sites (like gaming, on which I registered today), and creating a cumulated reputation graph with tooltips for sites specific reputations. it is coming soon @ http://stackshot.me - estimated time of arrival is 2 weeks. Not the answer you're looking for? Browse other questions tagged discussion website reputation app-request .